Surfactants can form a foam, facilitate the removal of dirt, and enable the mixture of water and oil. Despite concerns of environmentalists, these surface active chemicals are found in almost every household and are also used in numerous industrial applications. In 2016, a worldwide turnover of almost USD 31 billion was achieved with surfactants. For the third time already, Ceresana analyzed the global market: The latest report expects a growth of revenues of, on average, 3.1% per year. Surfactants are made from petroleum derivatives but can also be obtained from natural raw materials such as sugar, vegetable oils or vegetable soaps. The types of surfactants mainly differ in opposed polarity and different charges. The study examines anionic, cationic, non-ionic, and other surfactants. Important figures such as demand, import, and export are given both for these main groups and for individual product types. Anionic surfactants are currently the most important group with a global market share of 49%. However, the strongest growth market are non-ionic surfactants. Fatty alcohol ethoxylates (FAEO) dominate this type. The Asia-Pacific region is by far the largest consumer of surfactants with a world market share of 38%. There are clear differences in regard to the used product types: While Asia accounted for a market share of 43% of alkylbenzene sulfonates in 2016, consumers in Western Europe and North America dominate the market for alkyl sulfates (FAS), alkyl ether sulfates (FAES), and alcohol ethoxy sulfates (AES) with a share of 60%. Surfactants are used in numerous fields of application. The best-known applications of surfactants are cleaners and detergents for households as they help to remove dirt as washing-active substances. Around 55% of the overall demand in 2016 was registered by this segment. Besides the segments cleaners and detergents, cosmetics, and textiles, surfactants are also used in numerous industrial application areas. For the application area paints and plastics, Ceresana expects the highest global increase of approx. 2.1% p.a. until 2024. While demand for laundry detergent in form of powder developed more weakly in the past years, the market for liquid and highly concentrated detergents accounted for a significant growth. In the segment dishwashing detergents, tablets account for a considerable growth. A decisive factor for the development of the cosmetics industry is the rise of private consumption. The increasing demand for surfactants on the part of the cosmetics industry can be explained by the growing awareness of personal body hygiene and the available income that has been increasing in many countries in the past years. This trend is additionally reinforced by the increasing sales of products with natural and organic ingredients. Chapter 1 provides a description and analysis of the global surfactants market - including forecasts up to 2024: The development of revenues, production, and demand is analyzed for each region of the world. The figures are split by anionic, cationic, non-ionic, and other surfactants. In addition, there is a further division into product subsegments. Chapter 2 examines the market for surfactants in the 31 major countries in more detail: Revenues, demand, production, as well as import and export are evaluated per product types. Demand for surfactants of the individual applications is described in detail. In Chapter 3, the application areas of surfactants are examined for the regions Western and Eastern Europe, North and South America, Asia-Pacific, The Middle East, and Africa. Data on the development of demand are analyzed for the applications detergents and cleaners, industrial cleaners, personal care and cosmetics, textiles and leather, paints and plastics, and other applications. 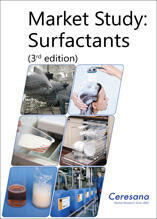 In Chapter 4, demand for individual types of surfactants is analyzed. Anionic, cationic, non-ionic, and other surfactants are considered separately. Additionally, a further subdivision of the group anionic surfactants into alkyl benzene sulfonates (LAS), alkylsulfates, alkyl ether sulfates/ alcohol ethoxy sulfates (FAS/ FAES/ AES), and other anionic surfactants is made. The segment non-ionic surfactants is split by fatty alcohol ethoxylates [FAEO], other ethoxylates, and other non-ionic surfactants (for example pure fatty alcohols, alkyl polyglycosides). Chapter 5 provides company profiles of the largest manufacturers of surfactants – clearly arranged according to contact details, revenues, profit, product range, production sites, and profile summary. Extensive profiles of 92 producers are provided, including Royal Dutch Shell plc, General Electric Company, BASF SE, The Procter & Gamble Company, DowDuPont Inc., 3M Company, Akzo Nobel N.V., Evonik Industries AG, and Solvay S.A.